There aren't many places that don't have at least one calendar magnet with a business imprint on the kitchen refrigerator. And that's what makes them such an effective promotional item! 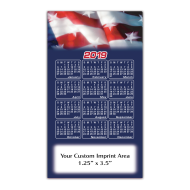 When you put your company's name on a personalized calendar magnet, it will be seen multiple times a day, allowing your business to enjoy long-lasting promotional exposure. 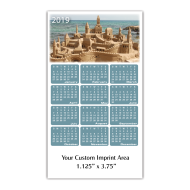 With their vibrant designs, calendar magnets customized with your company's imprint are a fantastic and affordable way to catch people’s attention. Add your company's logo, contact information, or any content that you want to get in front of your customers. Virtually any business can use them as a marketing tool and benefit from their exposure potential. Promotional calendar magnets are guaranteed to be seen because they are always displayed in the most popular place in the house – in the kitchen, on the refrigerator door! 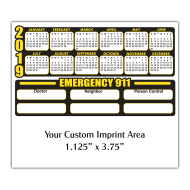 When placed on a desk, table or countertop, these calendar magnets invite your customers to take one and leave with a reminder of your agency and services, or they can be mailed with greeting cards, invoices or year-end statements. 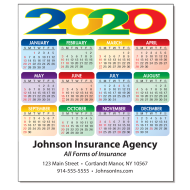 Order promotional calendar magnets for your business today!